The Tyrannian Battleground is an ongoing feature in the Battledome where you get to choose a faction to join and fight for every two weeks. At the end of each two week cycle, the Oracle awards prizes to the winning faction. The Battleground is a follow-up from the War for the Obelisk event, in which six factions fought over a magical obelisk that appeared in Neopia. Every other Monday, head on over to the battleground to enlist yourself among the brave warriors. You have three days to sign up with your faction of choice. Each cycle, three random factions will be selected to participate in that week's battle. The prizes you receive (see the Boons section below) differ depending on your faction, so it can be more advantageous to join in depending on the available factions. The fighting kicks off on the Thursday following sign ups and continues for four days. Your faction leader will help you keep track of your battles during each skirmish. In order to qualify as having helped your faction, you have to take part in at least 10 battles, regardless of difficulty. It is unknown at this time how the difficulty of the challengers affects the number of points your team receives. You can find a list of all the challengers in our In-Depth Battlepedia. If you allied yourself with the victorious faction during a skirmish, then you will be rewarded with your choice of boon (a fancy name for "perks") to enhance the site for the duration of the week-long truce. Each faction has its own list of priorities, so not all boons are available for every faction. The Awakened boons are random each week. Unlike the other five factions, they do not have a set list of boons to choose from. Instead, they will select 5 random boons to present if they win. The bonus Premium boons, however, will always be available. Bank Bribery Allows you to bump your interest rate at the bank by 3%. Shows and highlights r83+ items in shop restocks that are not shown to those without the boon. Essentially, extra items restock for the Neopians using this boon. Increases your pet's intelligence when you read it a book. You will receive two or four points instead of the standard one point. Cartogriphication Your pet will guide you in the right direction through the Faerie Caverns, leading you towards guaranteed treasure. Allows you to purchase stocks selling for 10 NP. Without this boon, the minimum purchase price for stocks is 15 NP. Doctor Who? Cures pets automatically when they contract any disease. Doppelgänger Unknown chance of being able to reuse one-use items in the Battledome. Double Bubble Unknown chance that a healing potion will refill itself after you use it on your pet. Equip ALL THE THINGS Allows you to equip one extra weapon to your pet, giving you 9 total weapons. Five-Finger Discount Discount of 10% applied when haggling at Neopian shops (not user shops). GRRRAAAAHHHHHH! Increases your pet's damage output by 10% in the battledome. Steal another person's avatar for the duration of the boon. 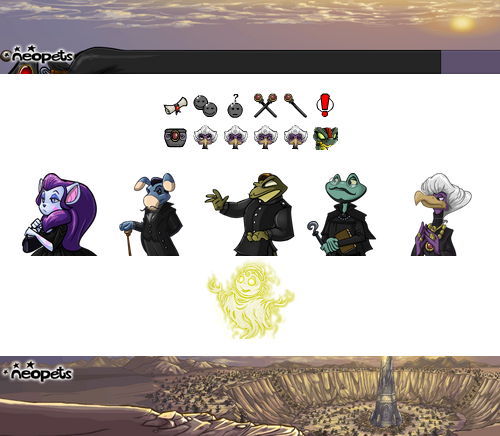 To steal someone's avatar, click on their active avatar on the Neoboards. You can only steal an active avatar. The stolen avatar is labeled as "Pilfered" and can be swapped at will by stealing another one instead. The person from whom you stole the avatar continues to have use of it themselves. Does not count towards your Neoboard Avatar score. Allows you to swap a faerie quest for a new one. Note: By refreshing your quest, there is a chance that you will get the Crafting Faerie, which requires NC and does not reward Battledome stats. twice before having to wait the usual time to spin again. Scratch Master Can buy two scratchcards one after the other before having to wait the normal waiting time between purchases. Gives the ability "Mind Blast" for use in the battledome for the duration of the boon. The ability is once per battle and uses your pets Intelligence points to calculate the damage done. That Millionaire Feeling Prior to November 2014, this would allow you to offer more than the TP limit at the time. Then, the normal TP limit was raised to 2,000,000 NP without this boon being changed, making it useless. 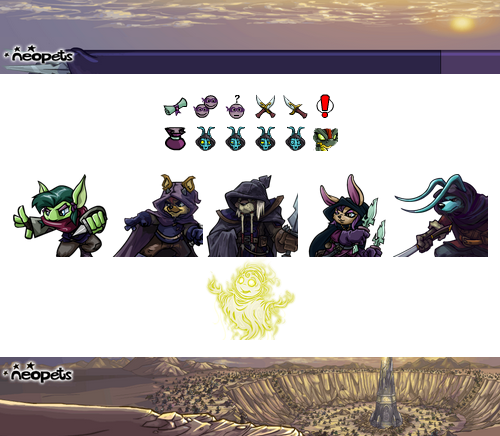 Additional Neopoints received from Space Faerie Scratchcards. Allows you to send 4 scores per day on the Premium Featured Game, instead of 3. More generally, you can send one additional score if there are any gaming events that allow more than 3 game sends. 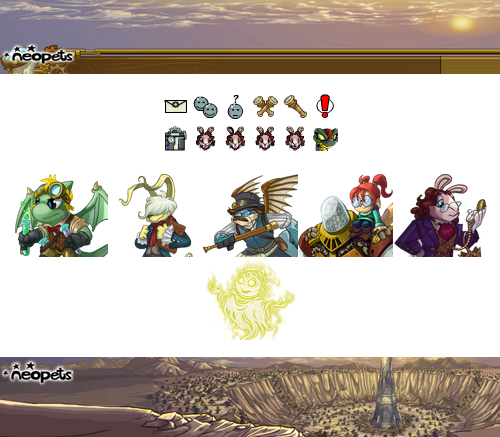 In addition to selecting your boons above, you will also receive the respective avatar and site theme for the faction you allied yourself with. 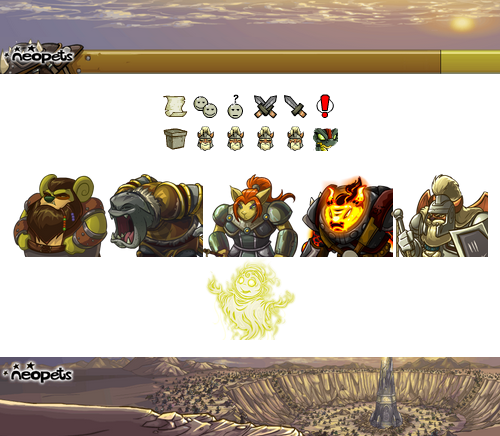 To receive all 6 avatars and all 6 site themes, you will need to join in (and hope your faction wins!) 6 of the two week cycles. Participate in the Battleground of the Obelisk and be a member of the Awakened when they win. Participate in the Battleground of the Obelisk and be a member of the Brute Squad when they win. Participate in the Battleground of the Obelisk and be a member of the Seekers when they win. Participate in the Battleground of the Obelisk and be a member of the Order of the Red Erisim when they win. Participate in the Battleground of the Obelisk and be a member of the Sway when they win. Participate in the Battleground of the Obelisk and be a member of the Thieves Guild when they win.